Can Bruno Latour's Cosmopolitics Save the World in Crisis? 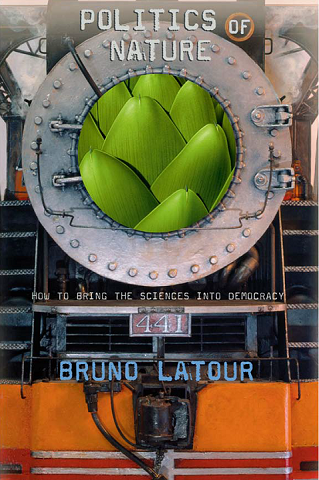 It has been ten years since the English translation of Bruno Latour's Politics of Nature: How to Bring the Sciences into Democracy (2004) was published. This philosophical work has been highly valued and very influential to the circles of green politics and deep ecology. Therefore, it is worth revisiting the book at the moment. I am not going to review the entire book in detail, but to point out some problems that rarely gets noticed. My point is that Latour's idea of cosmopolitics is in fact not enough to save the world from environmental crisis on not only practical but also theoretical level. By extending the ambition to de-dichotomize the separation of subject and object in his early work We Have Never Been Modern (1993), Latour argues in this later book that deep ecology has to give up nature as a standard for society and the way to do this is to give scientists and their scientific knowledge no priority to tell us what needs to be done for saving the world. By defining society as an assemblage of humans and nonhumans through so-called amodern standpoint, Latour suggests a new constitution in which powers are redistributed into four "functions": "the power to take into account" is about perplexity and consultation, and "the power to arrange in rank order" is about hierarchization and institution. The first power concerns the question "How many are we? ", and the second power concerns the question "Can we live together?". By doing so, Latour attempts to extend the realm of democracy from humans to nonhumans. Let me explain a bit more about this. In the principle of super-symmetry of Actor-Network Theory (ANT), humans and nonhumans constitute one another, and this constitution exists not only in the relations between non-scientists and things, but also in the relations between scientists and their experimental subjects. Truth about nature is constructed by humans and nonhumans, in every area of society, including laboratories. Because nature is not something "already there", it can not be represented faithfully and directly by scientists. In other words, what scientist do is to construct nature, with their their equipment and experimental objects. Thus, there is no substantial difference between scientists and politicians. Politicians represent voters distortedly; they construct voters'wants and opinions, rather than repeat voters' voice truthfully. If we don't trust politicians, then there is also no reason for us to trust scientists. To be sure, this doesn't mean that we should overlook or even oppose what scientists say. This only says that opinions from the public (ordinary people, politicians, moralists…) should be weighted as important as words from scientists. So, things have to be represented as a member of politics on the one hand, and scientists have no privilege to do so on the other. This seems a good combination of democracy and environmental protection because referring to Latour's model we can give nature a position in our collective without appealing to an external and absolute truth provided by scientists. However, in my opinion, Latour's idea of cosmopolitics can only solve the problem partly. By giving equal rights to humans and nonhumans, and scientists and non-scientists, to answer the first question "how many are we? ", Latour makes a more equal circumstance to discuss the second question "can we live together?". Latour requires the participants who join the second discussion to put their own benefits aside and only to consider what the best ranking of humans and nonhumans is for our future collective. However, as we always know, ranking — to put things in an order — is the most difficult work to take. If we look into real cases, we will see how unfeasible this idea is. the failure of getting a proper ranking reflects a serious theoretical defect of Latour's idea. I am now providing an example. There was a big earthquake in Taiwan on 21st September 1999. This disaster destroyed a lot of local residents' houses in Nantou, a county in the middle of Taiwan. Attempting to help those residents rebuild their homes, some architects launched a project to design and co-construct greener but cheaper houses. With a different shape and structure from the original houses, these new ones would be less material-using and land-covering, and at the same time more water-keeping and energy-saving. 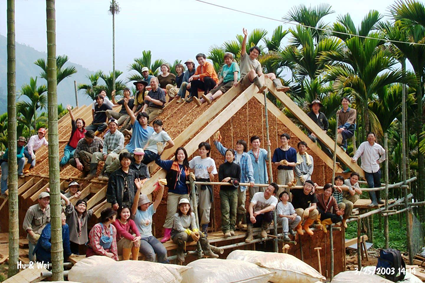 That is to say, the architects aimed to make the new houses more harmonious with nature, and in this way to reduce the possible bad effect of earthquake to the new houses if an earthquake comes again. 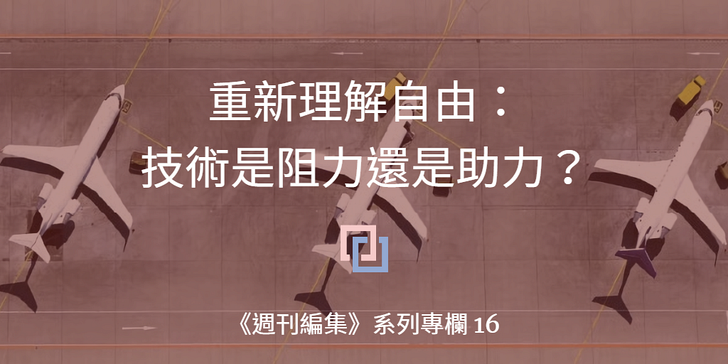 The working of design was free of charge and the construction fee was much lower than the average in Taiwan. However, as a case study has shown, at many joint meetings of residents, architects, and governmental officials, the local residents refused to accept the project because what they asked for were more modern houses in western style and made of reinforced concrete (RC)(Wu, 2005). Apparently, although the architects, as experts of green building, intended to be spokespersons — a term used frequently by Latour — of nature and fought for it, they didn't make it because others got no agreement with them. If the architects just gave no care about the residents' voice and completed the project in the name of nature, they would be blamed by Latourian scholars for being anti-democratic. When the architects followed Latour's suggestion that experts' voice should not and can not outweigh non-experts, they achieved nothing. How to deal with the situation like this? We don't know. There is no relevant discussion in Politics of Nature. Latour offers a framework of democracy for a human-nonhuman collective, but he says nothing about how to get consensus on the ranking of things. One might think that Politics of Nature is a philosophical work, so it's not its responsibility for such a practical difficulty. However, I would like to contest that this is not only a practical problem, but also a theoretical one. When asking people who join a discussion to not prioritize their personal interests and only consider common interests, Latour in fact is standing almost in line with political philosopher John Rawls. The ideas of consensus — a permanent agreement for all members in a collective, not just a modus vivendi — has to be preconditioned under the circumstance that all participants are behind the veil of ignorance, ensuring that they don't know their interests. But, as many studies have pointed out, a discussion under the condition of the veil of ignorance is too ideal to be true, and there is always a problem in transporting people to the back of the veil. As we can see in many cases, including the case above, people tend to stay where they are, keeping their personal wants and preferences. If it is so hard to obtain a social contract when only considering human affairs, how hard it would be to get a natural-social contract when all humans and nonhumans come into our agenda? Even though we, as humans, can really ignore personal interests, how can we know what common interests are? As feminist philosopher Sandra Harding (1991) has already argued, we are inevitably seeing from local and limited standpoints; we just don't have a God's eye. It would be a mistake to assume that it is possible for people to reach a consensus through a democratic process in which there is no personal preference. Moreover, in Latour's idea, the assumption that people should be unbiased is inconsistent with the assumption that non-experts' opinions have equal weight with experts in a discussion, because the latter assumption acknowledges that knowledge is always local, or situated, rather than universal. So, here are the options: either we are to be unbiased and deny the "interpretive flexibility" for reaching a unbiased consensus, or we are to treat all "situated knowledges" equal and forget about a need for a consensus. We can only choose one of them. There is one more defeat worth noting here. When adopting an approach much like deliberative or "discursive" democracy — a term used by political philosopher John Dryzek (1994) — which focusing on speech, Latour seems to leave the core idea of ANT behind, namely, action. In cosmopolitics, people communicate with each other to find a consensus on how to rank things. If the way to a consensus has only to be a speech-way, then things have to be represented by humans. In other words, in a speech-centered model of democracy, nonhumans are passive, mute, and waiting to be arranged by humans. Inactive things play no role in this kind of democracy. This becomes very problematic once we take environmental protection into account. For example, if we would like to build a building or a device to "nudge" people to act pro-environmentally, this kind of artifact would probably not be allowed in a human-speech-centered democracy. The reason is simple: most humans don't like losing their autonomy to take action and their freedom to make choices. Even though a "nudging-technology" is for human benefit, such as an eating-more-healthy-food or drinking-less-alcohol application on mobile phone, people often resist it. It is easy to imagine that any artifact having power to influence, to push, and even to control humans to be environmentally moral wouldn't and couldn't be passed in human-speech-centered democracy. This trouble in fact is not new: a lot of environmentalists have argued that the root of environmental crisis is practical as well as epistemological anthropocentrism. Latour's speech-approach of democracy is inevitably human-centered and therefore helps little with the mistake of anthropocentrism. In short, taking the position of anthropocentrism, purposely or not, his model of democratic cosmopolitics leaves no room for things to play active roles. Pointing out the shortcomings of Latour's idea in Politic of Nature doesn't mean that this book is worthless. On the contrary, this work inspired me to pay more attention to environmental issues through the eye of STS (science and technology studies), and I have read it for several times. What I would like to do with this short comment is to show opportunities that his idea could be made stronger. If the idea could be slightly altered to avoid political anthropocentrism, it would be more consistent with the spirit of ANT and make more contributions to environmental protection. Harding, S. (1991). Whose Science? Whose Knowledge? : Thinking from Women's Lives. New York: Cornell University Press. Latour, B. (2004). Politics of Nature: How to Bring Sciences into Democracy. (C. Porter, Trans.). Cambridge, Mass. : Harvard University Press. * English is not my native language, so please let me know if you find any language mistake. Thanks!